Francis Upritchard has taken a typically novel approach to tackling the Barbican’s unique but tricky Curve gallery, where she is about to unveil a huge body of new work. Her initial idea was to present a “rainbow-light spectrum that plays with distortion and scale”. And while she realised that idea was “too pedantic”, colour still dictates the viewer’s journey through the exhibition—it begins with the brightly hued figurative sculptures in polymer clay through which Upritchard has forged an international reputation, and ends with radically different works in balata, a kind of rubber extracted from trees in the Amazon rainforest (ethically and ecologically, she stresses). 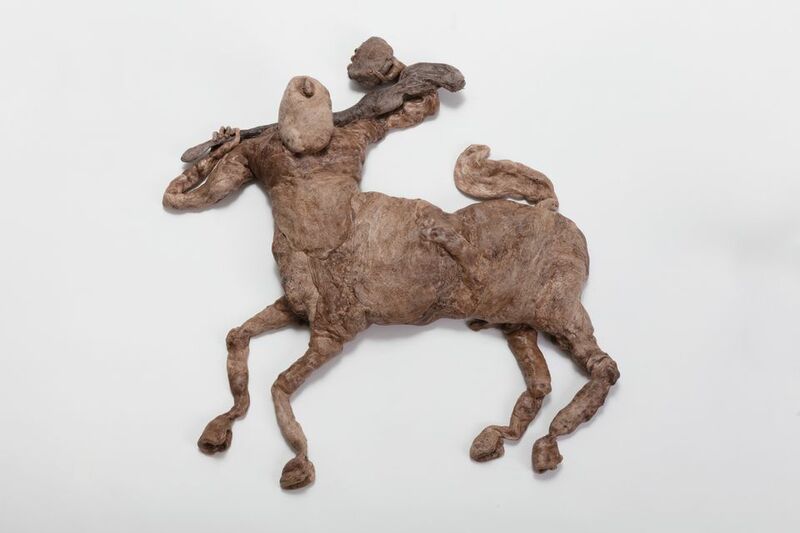 The balata sculptures, including centaurs based on the Parthenon reliefs are a new departure for Upritchard, made through a complex process of boiling and cooling the material before pulling it into forms on tables and in a bath filled with water, leading to a patina that evokes the balata’s woody origins yet also has a rich marbling. Passionate about the physical process of making, Upritchard collaborates with other artists and designers, from the glass artist Jochen Holz to her designer husband Martino Gamper, bringing different arts and crafts into conversation. “I’ve always had a big problem with the hierarchy within art, craft, jewellery, design; I think it’s weird and silly,” she says. 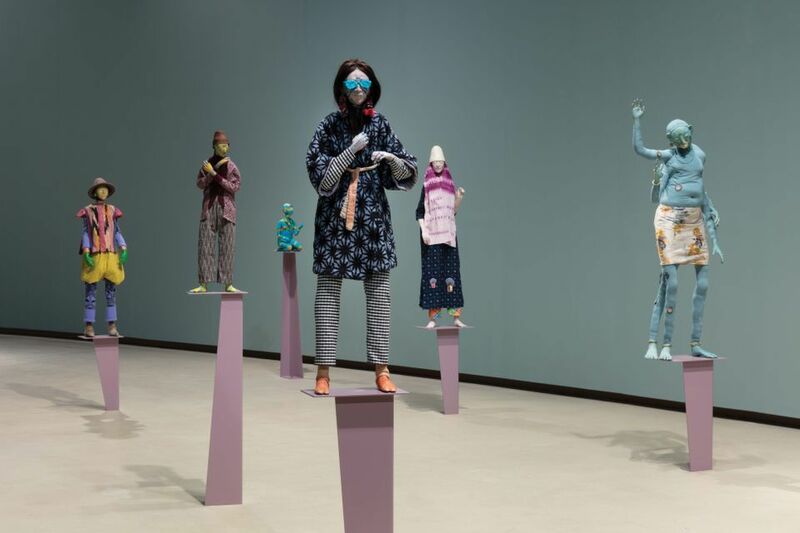 And her Barbican exhibition reflects this: it can be viewed as a kind of “materials retrospective”, she says, featuring her work in sewing (including a display of hats), ceramic, bronze, glass and thermoplastic, as well as the polymer clay and balata. Characteristically, these disparate works are shown on specially designed display structures, subverting the humdrum plinth and vitrine, and creating a total environment that plays with architecture and museology. Her figures draw on an array of references, from Indian miniatures to Romanesque frescoes, and from ancient sculptures and burial grounds to science fiction. 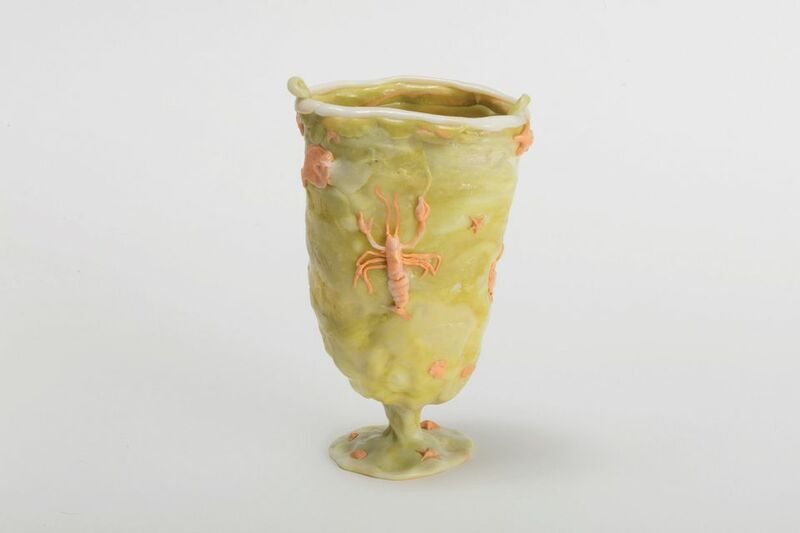 Together, the range of techniques and references has prompted one of the most original sculptural languages on the contemporary art scene. The Art Newspaper: Where does the Barbican show’s name, Wetwang Slack, come from? Francis Upritchard: It’s a very important site for pre-Roman civilisation [in East Yorkshire, north-east England]. It’s super-important as a site because of chariot burial, and historians didn’t realise until then that our English ancestors did chariot burial. And it’s just such a great name. And also the balata—the way I work with it is wet, and it’s quite slack when I’m working with it. Somehow, those words made me laugh so much. It makes me think of peat bogs. Yes, even though it’s just the name of a place, it still makes you think of that. At what point in the whole process did the title emerge? Actually, I wanted to call it Purple, but then John Akomfrah’s previous show was called that, so that wasn’t going to work. But I went to Hull with Brian Griffiths, the artist, because we were in a puppet show together, and on a day off, went to a museum and there was this hilarious, creaking figurative diorama of pre-Roman life in Britain, Wetwang Slack. I took a photo of it, and thought it was a great title for a show. I forgot about it. And then, looking through my photos after Purple got removed, there it was. You have got a scale model of the Curve gallery—have you had to think about the space more than you would a white cube? Well, coming up with the idea of it being the colour spectrum, even though that is really hokey and doesn’t make sense, helped me to decide to do this thing of being bright at the beginning. Because I was wondering how the polymer clay sculptures would work with the balata works. They are both figurative, but the intention of the figuration is really different. The [polymer clay] figures are very exact and I take a lot of time with them, and the balata pieces are wild, they happen really fast and there is quite a lot of detail, but you can’t do so much. Where did you discover the balata? I was with Brian Griffiths again on a residency in Brazil, in the north, and both of us use a lot of found objects. We asked where the flea markets and second-hand stores were and people didn’t know what we were talking about. We were in a small town and there weren’t any, as everyone uses everything until it’s finished. So I went to a craft market instead and met this man Darlindo, who I’ve worked with ever since, and he made these really beautiful, very exquisite little… I don’t know if you’d call them toys or souvenirs or sculptures, probably all three, out of balata. I thought they were so charming and I asked him if I could come and have a lesson. And so he’s my dealer now. I’m the only person, according to him, outside of the Brazilian rainforest working with this material. In that lesson, did you see that you could naturally adjust your language to this strange new material? All my work is like that. It’s always adjusting to new materials, because I’m fascinated by materials and love working out how to work with them. And so that’s just always the case. There has always been a sense of narrative in your work, without ever having it fully explained. Is that a fine balance to strike? Yes, and that’s why you never see two of my works interacting. The centaurs are all in a row, all going in the same direction or looking off. And you can never look into their eyes and have a conversation with them. There are clues but they’re not, really, because even I don’t know. You’ve talked about the figures as husks. What do you mean by that? It’s not a person. When people say, she’s a nice sculpture, he’s a nice sculpture, I’m like: “No, no no, no: it.” It’s a sculpture. It’s not a human, it’s not even a doll. Is it even a representation of a human? I think of them almost in the way that people’s clothing signifies so much about them—these are more like outfits. But then you’ve made works that draw on actual people, like your gallerist Kate MacGarry and members of your family. How does that process work? [She points to an Indian miniature she has referenced in one of her sculptures.] It’s like this Indian painting is from somebody else’s interpretation of a person, an Indian mystic painter, and my drawings from that are a translation process. I have got a family of friends called the Pembertons, and they have just got lovely faces, four girls. I use their faces quite a lot because it’s a particularly English look that I like. And I like big noses. Sometimes they are sort of someone, but they are never really someone. I never try and get it exact. You are creating a sort of collage of cultural forms. Are there any moments where you feel that it is too on the nose, where you don’t want it to clearly evoke a particular issue? Yes, because that’s a difficult matter in the art world now. But this is something I’ve been interested in for a very long time. And I hope I’m being sensitive and doing it right, because we are all humans and I’m magpieing—I’m always mixing. I think it might be because I am from New Zealand, and I was away from where probably most of my ancestors are, which is here [in the UK], when I was growing up. There was this funny white culture and the Maoris were really being suppressed and it was very confusing. I felt like I was always the other—people were still talking about home, meaning England, three generations later. And Maori culture is amazing about place and home, being part of the landscape and connected to the land in a way that is really beautiful. When you say other, do you mean as an invader, a colonial presence? Yes and no, it’s just that I was always fascinated with everything and I felt like my own culture wasn’t particularly exciting or interesting. Since 1998 you’ve been in the East End, so you’ve situated yourself in a part of London where other cultures are immediately present whenever you leave your home. Yes, which is so important to me, and so great. That stuff is in my work. I read everything and it is there, but I really try not to be specific because I don’t want to represent anyone. And I don’t think art is for that. These are all portraits of me, because it’s all my experiences and what I’ve seen and I’ve done. That’s why I do this loose research, so I can’t say I am going to represent any exact thing. The stone used in the display furniture in Upritchard’s Barbican show originates from Tramin in South Tyrol, northern Italy. While Upritchard was in the area, she saw the mythological creatures depicted in the 12th-century Romanesque frescoes in St Jakobs Chapel, Kastelaz. She chose to respond using another new material for her, a thermoplastic. “You sculpt it like the balata, so I thought it was interesting that it had this very similar way of working, but colourful,” Upritchard says. “I embed the colour, because white is its natural colour. So I make the marble tone and a bit of a fake glass effect.” The work is shown alongside works in glass and ceramic that display a similarly exuberant and irreverent response to her materials. 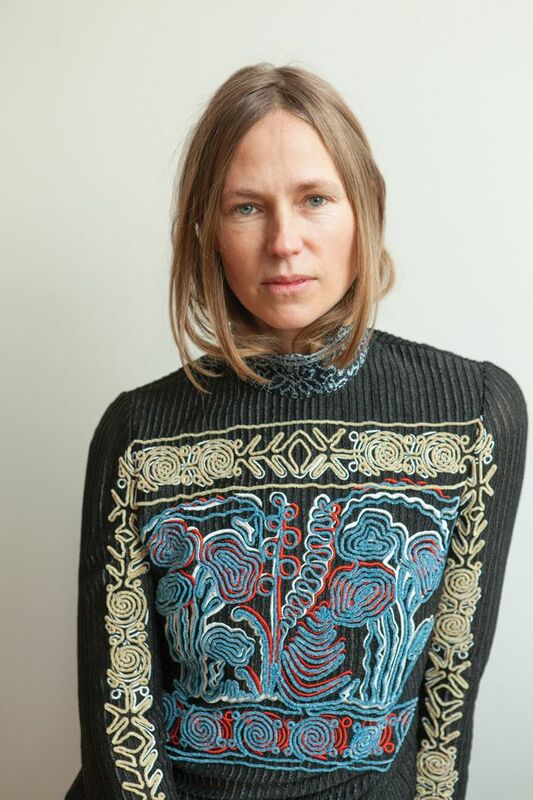 Soon after arriving in London she co-founded the artist-run space Bart Wells Institute with the painter Luke Gottelier, one of the thriving countercultures to emerge in the wake of the by then mainstream Young British Artists scene. Upritchard began showing regularly in the UK and New Zealand in the 2000s, with residencies at Camden Art Centre, London, and the Auckland Art Gallery. A landmark show Save Yourself, created in a Grand Canal palazzo while representing New Zealand at the Venice Biennale in 2009, created an international platform for her work, and she has gone on to show in museums as diverse as the Vienna Secession in 2010, Nottingham Contemporary, UK, in 2012, Cincinnati Contemporary Arts Center, US, in 2012, Marugame Genichiro-Inokuma Museum of Contemporary Art, Japan, in 2013, and the Hammer Museum, Los Angeles, in 2014. A solo exhibition, Jealous Saboteurs, travelled in 2016 and 2017 from Melbourne, Australia, to Wellington, Christchurch and Dunedin in New Zealand. She returned to the Venice Biennale in 2017 as part of the international exhibition Viva Arte Viva, curated by Christine Macel. Kate MacGarry, London; Anton Kern Gallery, New York; and Ivan Anthony Gallery, Auckland.